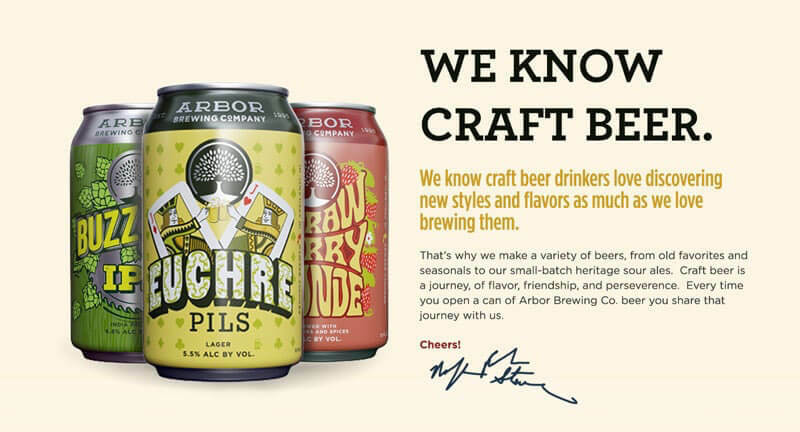 Arbor Brewing Co needed to take their web presence to the next level. We answered the call. 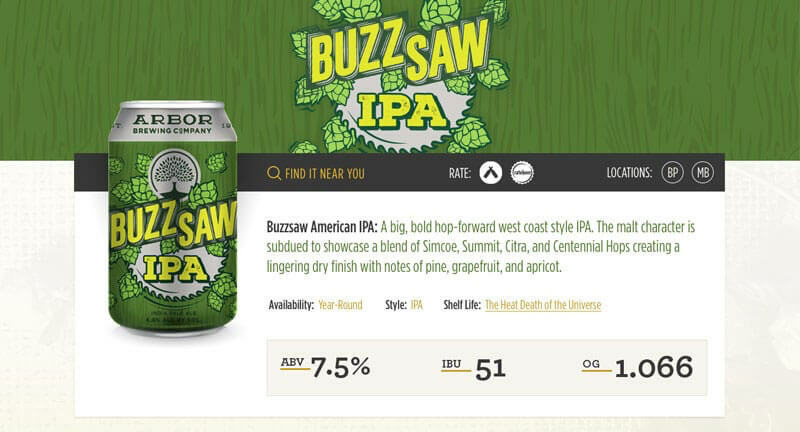 New ownership brought about a brand refresh, a new set of label designs, and joining a sea change sweeping the micro brew world- switching from glass bottles to cans. 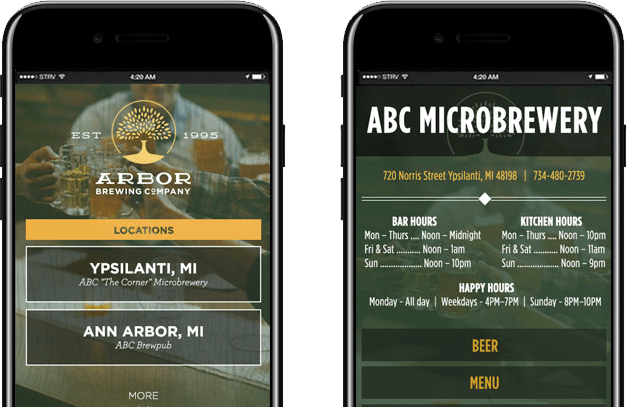 Our job was to take this transition and build a website that would encapsulate all of these changes, reintroduce people to the brand, and create a more streamlined experience for folks visiting their brewery and restaurant locations. Getting to work with such a well known local brand was an exciting opportunity, and we grabbed hold of it with both hands and built a unique brand experience. Using the site’s historical traffic data as a guide, we extracted the intent and desire of the on-the-go users and tailored the mobile experience to put location and menu information front and center. We took every opportunity to showcase the new brand, and in turn the beer that bears its mark. As an Ann Arbor establishment expanding their reach, it was critical to both maintain the long term integrity of the brand, while also highlighting the fresh new changes they’re undergoing as a growing business. With great content, comes great headaches trying to manage it and keep it looking nice. We don’t take any chances in that arena- the last thing we want is for your site to immediately degrade in quality post-launch. We build powerful content management tools, custom to each site, which preserve the integrity of the original designs while giving you the freedom to add, remove and manage content with ease. They want to know where to go, what to eat, and if you’re still open! So we tailored the mobile experience to focus on these critical questions first and foremost. The result is pure one-handed tipsy-strolling bar-hopping joy. There’s a veritable cornucopia of off-the-shelf menu solutions, and as you would expect, one size fits none. So we built one that took into account all of the quirks and nooks and crannies of their locations’ menus and made it easy to use too! 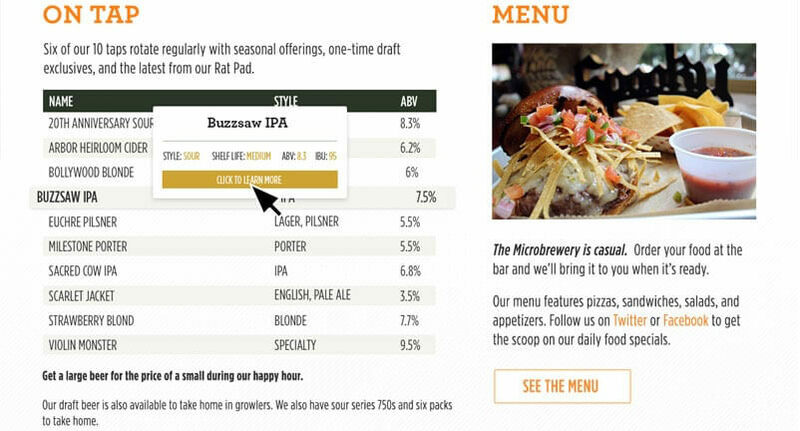 Now visitors always know what’s on the menu, and more importantly, what’s on tap, before they set foot in the bar! Get your free copy of our guide to getting the website you want in 2018!